WHAT: When your child is sick, it’s hard to keep up a normal daily routine, and even harder doing so during the holiday season. This is something that Paul Turano, executive chef/owner of Tryst located in Arlington, MA and Cook in Newton, MA, knows all too well, having spent time with his son at Boston Children’s Hospital’s Hematology, Oncology and Stem Cell Transplant Units during past holidays. Both Turano’s children have Severe Combined Immune Deficiency Syndrome (SCIDS), and when his son was just two months old he had a bone marrow transplant at Boston Children’s Hospital that saved his life. In cooperation with Boston Children’s Hospital, Turano has set up a branded donation page online and will be encouraging holiday donations for the family resource program from December 1st, 2015 through December 31st, 2015. To donate, guests can visit the donation page online on either one of the restaurant’s webpages. In exchange for donating, Turano will give donors a gift certificate to Cook or Tryst (for up to $20) with proof of donation. “I can’t emphasize how much The One Mission Resource Room helped my family and I when we were going through this difficult time. It’s because of their team and services that we were able to maintain a sense of normalcy and routine, and I want to be able to give that back to other families that are going through it,” said Chef Turano, Executive Chef/Owner of Tryst and Cook. WHEN: December 1st, 2015 through December 31st, 2015. HOW: Donate on http://fundraise.childrenshospital.org/goto/chefturano2015. 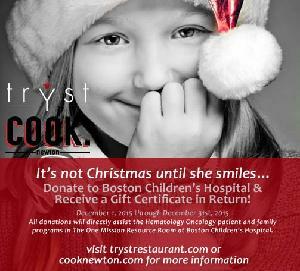 After donation, present your receipt at Cook or Tryst to receive your gift certificate (of equal value, up to a $20 value).